The best way to get to know a community is by scheduling a tour. See the facilities, meet the staff and residents, and get a feel first hand what it's like to live at Bayada Home Health - Falmouth - MA Home Care. At BAYADA, we believe our clients and their families deserve home health care provided with the highest professional, ethical, and safety standards. This belief guides how we hire, support, and develop our health care professionals - and it is demonstrated in the expert, compassionate care they provide. BAYADA verifies work history, credentials, and references and performs thorough background checks. Our professionals also undergo in-depth interviews, written testing, and hands-on skills assessments before they are hired - and all are fully insured before they visit their first client. All BAYADA health care professionals are supervised by a registered nurse (RN) clinical manager. The clinical manager or the BAYADA primary clinician makes regular home visits to ensure clients are receiving the highest quality care. Additionally, we reassess each care team member's skills on a regular basis. No matter what time of day or night, clients and their care team have access to a 24-hour clinical support team member from their local office should any questions or concerns arise. Each BAYADA caregiver also has a clinical manager who provides ongoing mentoring and support. Our professionals partner with clients and their families in providing care. We communicate regularly with clients, family caregivers, physicians, and the entire care team. BAYADA is unmatched in our commitment to providing education and training to our home health care professionals. Through preceptor education programs, mentoring, hands-on lab work, in-service programs, and scholarships for professional development, our caregivers continue to expand and improve the clinical skills they bring to their clients. BAYADA is accredited by Community Health Accreditation Program (CHAP), the leading accrediting organization for the home health industry, for voluntarily meeting the industry's highest nationally recognized standards of care. 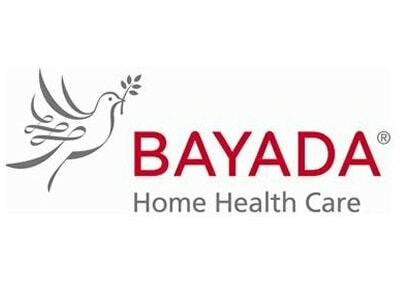 The rigorous accreditation process involves a thorough examination of the business and service aspects of the entire BAYADA Home Health Care organization - including office and client visits - in order to evaluate service quality, structural strength, organizational effectiveness, and human and financial resources. At BAYADA, we all share a commitment to providing care with compassion, excellence, and reliability - the core values of our philosophy, The BAYADA Way.